If Netflix is the new video store for the digital age, it makes a certain degree of sense that they would have a selection of what used to be called DTV movies—direct-to-video. Horror fans of a certain age know the curse of the DTV genre flick because there were new ones seemingly every week, and us horror fans are treasure hunters. We’re always looking for that unheralded gem that just didn’t get the studio support or a marketing budget but is totally worth a look. However, we also know that ninety percent of these DTV movies bypassed a theatrical release for one simple reason—they weren’t very good. 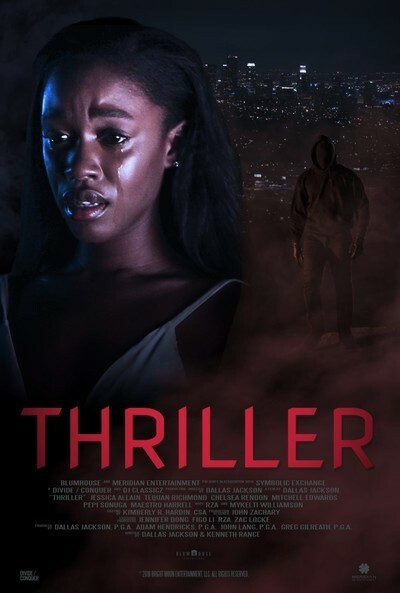 Lately, Netflix has been expanding their catalog with what could be called the modern DTV flick, a movie that doesn’t get much fanfare but that will likely draw the curiosity of horror fans. Movies like “Mercy Black” and “The Basement” will never do “Bird Box” numbers but they don’t need to. They just need to draw the attention of the same people who used to scour the New Releases shelf for movies like “Cheerleader Massacre” and “Hell’s Highway.” Into this growing morass of genre mediocrity, the service has now released “Thriller,” a cheaply made, poorly executed riff on “I Know What You Did Last Summer” with a twist that is both easy to see coming and flat-out ridiculous. It’s a movie for which a customer might have demanded a refund in the DTV days. Dallas Jackson’s “Thriller” opens with a horrible act of cruelty that is compounded by tragedy. A group of awful children lure a shy boy named Chauncey into an abandoned home and then terrify him wearing skeleton masks. He panics and pushes one of his attackers, knocking the kid over a second-floor railing. All the other kids somehow convince the cops that Chauncey did this entirely on his own. He was the bully—not them—and he killed a classmate. (Don’t ask how on Earth the evidence could support that. This ain’t that movie.) Chauncey goes away for his crime. Cut to Homecoming weekend four years later. A buff Chauncey (Jason Woods) has been released, a fact that terrifies the now-teen classmates who basically abused and framed him. They start to worry that Chauncey will come for his revenge, and a few of them become convinced that they’ve seen Chauncey stalking them. And then they start getting murdered by a man in a hoodie and mask. Is it Chauncey coming back for vengeance? And how will they survive? The real shame is that you can see talented young performers getting lost in this nonsense. Jessica Allain, Mitchell Edwards, Paige Hurd—they’re all solid—and who doesn’t want to watch a movie in which the musical genius that is the RZA gets to play a tough-talking high school principal? You even get to hear RZA mutter at one point, “This kid is dead.” Sadly, by then, so is the movie.